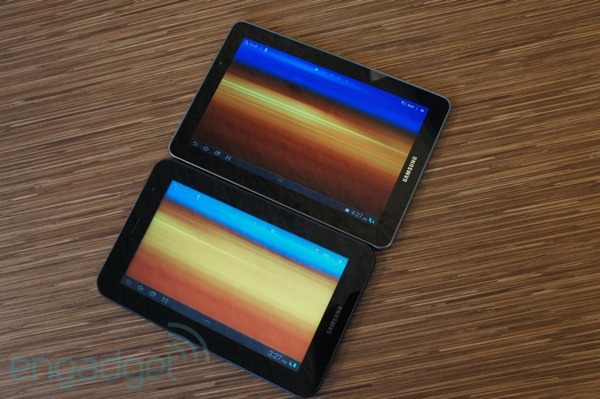 Within an 11-day period last fall, Engadget published reviews of two different Samsung Galaxy tablets. At the time, we felt the company was turning into a caricature of itself, with slates in every conceivable size, including 10.1, 8.9 and 7 inches. Mostly, though, if we sounded exasperated with Sammy's "see what sticks" strategy, it was because the outfit unveiled not one, but two 7-inchers over the course of a month. One of these, the 7.0 Plus, went on sale in the US back in November, with mid-range specs and a mid-range price to match its in-between size. But that tablet always felt like a consolation prize next to our second contender, the Galaxy Tab 7.7, which brings a brushed metal back, 10-hour battery and Super AMOLED Plus, 1280 x 800 display. Even on paper, it always seemed promising. Special. Maddeningly, though, those of us here in the states still can't buy one through the likes of Best Buy and Amazon, and though Verizon Wireless plans to sell an LTE-enabled version, we know scant few details about when it will arrive, how much it will cost or whether there will be an off-contract option. Luckily for us, our friends over at Negri Electronics hooked us up with an international model, one with 16GB of internal storage and WiFi, HSPA+ and EDGE / GPRS radios -- a doozy of a tablet that would cost you $668.50 if you were to import it to the US. (You can buy it domestically if you live in select markets like the UK.) So is the product novel enough to warrant that novelty price? Find the answer to that question and more after the break. With record-breaking battery life, a gorgeous display and thin design, this tablet raises the bar for 7-inch slates. 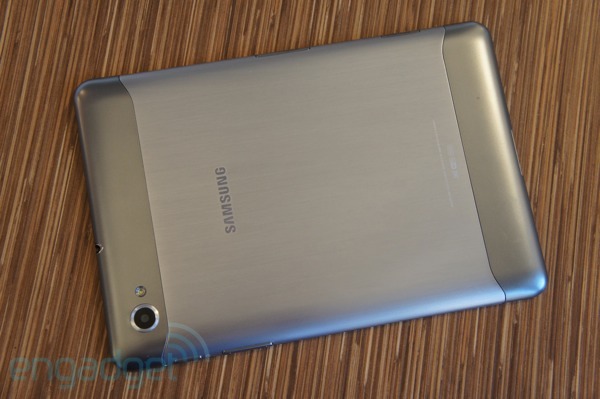 How would you rate the Galaxy Tab 7.7? If you were to compare our last few reviews of Galaxy tablets, you might find the design paragraphs tend to bleed together. Thin, lightweight. Well-made, but plasticky. Wash, rinse, repeat. But the 7.7 feels like more than just a rehashed device re-tooled to accommodate an odd screen size: it's a clear step up from the original Galaxy Tab, along with the 10.1, 8.9 and 7.0 Plus that have followed since. With this device, Samsung trades the tried-and-true plastic backing for a brushed metal lid with plastic strips on either end, allowing for optimal antennae reception -- a design choice that brings to mind the Flyer and other HTC-made devices. Like the 10.1, there's a thin metal ring around the front surface, though it's a thinner, more subtle band than before. So far as we can tell, the bezels are the same width as the ones you'll find on the 7.0 Plus which is to say they're reasonably narrow. And that's not even mentioning that stunner of a Super AMOLED Plus screen. What more can we say, then? It doesn't take a loyal Samsung fan to tell this is simply a higher-quality piece of kit. At least as far as the industrial design, those of you who impatiently bought the 7.0 Plus needn't feel too jealous: at 335g (.74 pounds) and 7.89mm (.31 inches) thick, it doesn't feel much thinner or lighter than its smaller sibling, which weighs 345g (.76 pounds) and measures 9.96mm (0.39 inches thick). In any case, both devices are exceptionally slim compared to other 7-inch tablets. Also, while the casing here is made of metal, those flimsy door covers have carried over from earlier models. So to anyone making do with an older Samsung tab, we can assure you the build quality hasn't improved drastically. Both the 7.7 and 7.0 Plus feel solid, save for those skimpy port covers; it's just that the 7.7 looks nicer, and feels more pleasing in hand. Interestingly, Samsung has placed the 2-megapixel front-facing camera on one of the shorter, portrait ends -- just like on the 7.0 Plus. 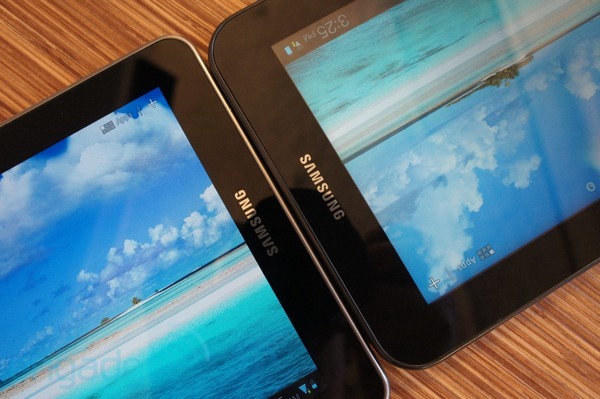 If you remember, though, the Galaxy Tab 8.9, has a landscape-oriented front camera, suggesting that larger tablet was intended to be used primarily in landscape, not portrait mode. It's clear, then, that whatever that magical cut-off set by Samsung's design team, it's larger than 7.7 inches, but smaller than 8.9. Which makes sense to us, given that the 7.7's 16:10 aspect ratio makes it far easier to type in portrait mode. Depending on the size of your hands, you might be able to swing landscape too, though if you have smaller fingers like some of us, you might want to consider installing SwiftKey X as an alternate 'board. Continuing our tour around the device, you'll find the mic slit directly to the left of that front-facing camera, with the 3.5mm headphone jack sitting on the top edge of the device, just behind it. The opposite side (read: the other portrait end) is home to twin speakers, along with the proprietary docking connector Samsung has used on all of its Galaxy tabs, which you can use to charge the device via USB or the included AC adapter. As with the 7.0 Plus, you won't find an USB socket on the device itself; any tethering to your PC must also happen by way of that special connector. Turn the device around so that the front camera is on your left, and you'll see that long edge on top houses the power / lock button, along with a volume rocker. On the side opposite that, you'll find the SIM and microSD slots. Inside, the tablet packs the usual array of radios and sensors, including 802.11n WiFi, Bluetooth 3.0, an accelerometer, digital compass and gyroscope, along with proximity and ambient light sensors. Interestingly, Samsung decided not to include an IR emitter -- something it built into the Verizon Wireless-bound 7.7 and the lower-end 7.0 Plus and paired with Peel's universal remote app. Additionally, A-GPS and GLONASS are on board, as well as EDGE / GPRS (850, 900, 1800 and 1900 MHz) and 21Mbps-capable HSPA+ (850, 900, 1900 and 2100 MHz) radios. Naturally, the US version headed to Verizon Wireless will instead offer LTE and CDMA connectivity. You can place a call with the tablet pressed against your ear, though we only recommend doing this once, for comic effect. We wouldn't go so far as to call this hulking thing a phone, but Samsung did go out of its way to bundle a calling application so you don't have to wonder if Skype and other apps will play nice with this particular device. Sammy's touting a so-called Receiver Mode that allows you to avoid broadcasting the call to others -- even if you're not wearing a Bluetooth headset. Indeed, you can place a call with the tablet pressed against your ear, though we only recommend doing this once, for comic effect. Suffice to say, you'll probably want to plug in headphones or pair the tablet with a Bluetooth earpiece. To be clear, you'll need a SIM in order to place calls from the app, even if you have a WiFi connection. At that point, you can place VoIP calls, or turn off HSPA+ and WiFi for a more old-fashioned sort of connection. As you'd expect, when you use the app your friends will see an incoming call from whatever number is associated with the SIM. All told, callers often had trouble hearing us, and either asked us to repeat ourselves or answered our questions with non-sequiturs after misinterpreting our side of the conversation. At worst, friends said we sounded muffled, and that they could only follow along if they happened to be parked in quiet areas. At best, we were told the call quality was clear but distant. For our part, calls sounded a bit less natural with headphones, though that's obviously a more ergonomically sensible solution than holding the tablet to your ear. We also placed some calls over the speaker, which proved sufficiently loud -- if we happened to be calling from a quiet room. And what an intuitive app you have to place all those calls. Once you sign into your Google account -- a key step in setting up your new tablet -- the 7.7 will silently copy any existing Google contacts, so that your favorites and friends' numbers will appear as they do on whatever Android handset you already happen to own. 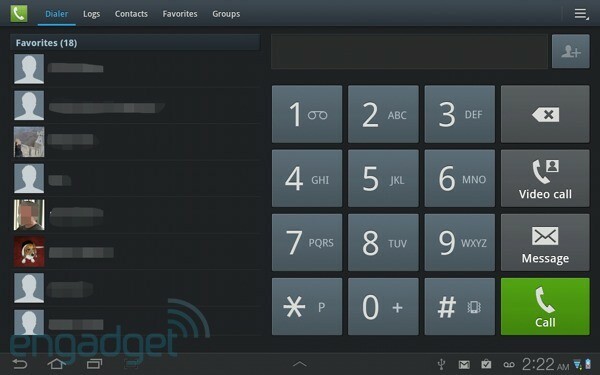 (Whatever contacts you have stored on the SIM card will show up too, unless you un-check that option in the settings.) Conveniently, the dial pad also includes large, finger-friendly shortcuts for starting a video call or sending a message, which can take the form of a simple SMS or an MMS with a photo, video, sound clip, location, sketch, contact, calendar event or memo attached. The contrast here is so deep, and the viewing angles so wide, that other tablets' screens look washed-out in comparison. 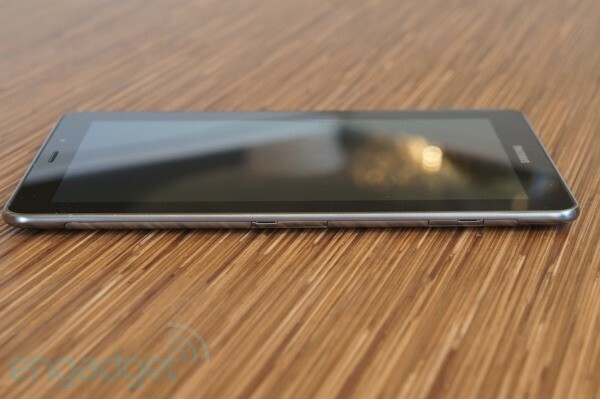 Remember how we said 7.0 Plus owners shouldn't feel too resentful of the 7.7's build quality? Yeah, well, that statement didn't include the 7.7's 1280 x 800, 197 pixel-per-inch screen. As it happens, this is the first Galaxy Tab to rock a non-pentile, Super AMOLED Plus display, and man, is it a winner. We could tell you it's vibrant, stunning and breathtaking, but even that wouldn't quite do it justice. The contrast here is so deep, and the viewing angles so wide, that other tablets' screens look washed-out in comparison. By itself, for instance, the 7.0 Plus' display is plenty bright and pleasant to look at, but place it next to the 7.7 and the transition is about as jarring as moving from the Transformer Prime to the Ainovo Novo7 (check out our comparison gallery toward the end if you think we're exaggerating). The Super AMOLED Plus panel represents a clear step up from most other tablet displays, which sadly haven't received the same level of tender lovin' care as their smartphone cousins. And, at the risk of getting ahead of ourselves, the 7.7 also has phenomenal battery life, so the gorgeous display makes an especially excellent foil for that 5,100mAh juicepack. After all, if your tablet's capable of a 12-hour movie marathon, it may as well have a striking display to match, right? Also, because the runtime on this thing is so fantastic, we had no qualms about cranking the brightness while using the tablet outside, which made the screen easy to make out in direct sunlight. If you like, you can also choose from one of three color modes, including standard, dynamic and movie. And, on a note unrelated to the beauty of the display, the panel used here offers some excellent palm rejection. Not only that, but we were also able to grip the tablet in one hand without accidentally opening apps or disturbing the onscreen menus. The 7.7 won't be the exceptional tablet with good enough sound to replace a dedicated set of speakers, but for what it is, the sound is loud, and the audio quality relatively balanced. We only noticed a smidgen of tinniness while listening to The White Stripes, though we did catch some distortion while blasting Gorillaz at top volume. It's worth repeating, too, that both speakers are on the same side of the device, which means you won't enjoy stereo sound if you watch a movie in landscape mode. The 7.7 is the longest-lasting tablet we've ever seen. Not the longest-lasting 7-incher, but the longest-lasting tablet. Like the Galaxy Note, which was announced on the same day, the 7.7 packs a Samsung-made, dual-core 1.4GHz Exynos processor, along with 1GB of RAM. The tab also has a Mali-400MP GPU. Though the Note and 7.7's numbers are too disparate for us to call this an encore performance, it's safe to say this is one of the fastest Android tablets on the market, especially in that sub-category of 7-inchers. As you can see, it faces its stiffest competition in the 7.0 Plus, which also has 1GB of RAM, along with a slightly slower 1.2GHz dual-core CPU. (We'll take the 7.0 Plus' astronomical Quadrant score with a grain of salt, as the test favors devices with lower-res screens, but suffice to say, its graphics scores in Nenamark are impressive.) Aside from that, the 7.7 established a wide lead over competing tablets like the T-Mobile Springboard and the Toshiba Thrive 7". By all metrics, this thing is speedy. For the most part, the 7.7 backs up its stellar benchmark scores with fluid performance. In particular, we were impressed with how smoothly the screen responds to pinch-to-zoom, and how nimbly websites and other pages re-scaled. The tab's quick to launch apps and respond to all manner of taps and swipes, though it's not completely immune from the sort of mundane sluggishness we've observed in other Honeycomb tablets. Occasionally, the 7.7 paused when we moved to minimize an app. Once, too, we noticed some stuttering while scrolling in the browser, though this ultimately proved to be the exception, not the rule. The accelerometer is also quick -- almost too quick -- to detect changes in orientation, so much so that we often had to tilt the tablet to change the orientation back again. Again, though, these are small blemishes on an otherwise spotless experience. The 7.7's 5,100mAh battery is rated for up to 10 hours of video, but in a rare twist, we managed to squeeze out more runtime than that. Much more. All told, it lasted a staggering 12 hours on our video looping test, even with WiFi on and the brightness fixed at 50 percent (3G was disabled). That makes it the longest-lasting tablet we've ever seen. Not the longest-lasting 7-incher, mind you, but the longest-lasting tablet -- one with enough juice to trample the iPad 2's long-standing record by an hour and a half. The 7.7 also has a battery-saving mode, so presumably you could push past that 12-hour-mark -- you know, in case you need your tablet to stay alive through more than just a roundtrip flight from New York to LA. What's insane, of course, is that this tablet also happens to be one of the thinnest we've seen. If Samsung can build a tablet this slim without skimping on battery life, what's Toshiba's excuse? Or Motorola's? In a way, the 7.7 reminds us of the Droid RAZR Maxx, a phone we reviewed just last week: we recommend it in its own right, but we also like to think it could be a harbinger of other long-lasting devices to come. 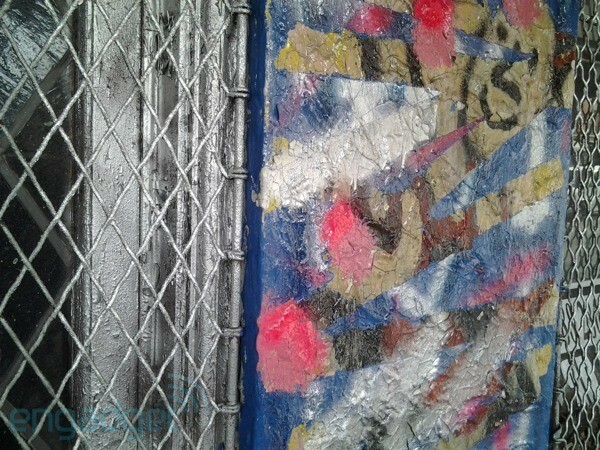 Though other 7-inchers offer a bump in resolution, the 7.7's 3-megapixel / 720p camera nonetheless captures an impressive amount of detail, staying faithful to the grease on a plate of hash browns, and the rough texture of concrete walls. We were also generally pleased by the balanced, not-too-saturated colors, though twice during our testing the tablet spat back images splashed with a blue overcast. In the case of this photo, at least, we were able to achieve more natural results on our second try, but even then the background appeared washed-out. In a few other sample pictures, too, details like clouds and the blueness of the sky simply get lost in translation. And, in a neat touch, you can zoom in on photos by pressing a thumb onto either end of the screen and titling the tablet back and forth. Thanks to the flash, we were able to eke out some clear shots in a restaurant, though as you see in the gallery, most of our shots taken in the dimly lit bar are peppered with noise particles. As you'd expect, the Tab 7.7 goes the way of every other recent Galaxy Tab and comes loaded with Samsung's own TouchWiz UX layered on top of Android. For now, that would be Honeycomb (version 3.2, to be exact), though the company has said an update to Ice Cream Sandwich is coming... eventually. We won't spend too much time rehashing the ins and outs of the user interface, as this is ground we've tread many times before. Suffice to say, Samsung has tinkered with almost every aspect of the experience, including the calendar, among other key apps. Also on board: Game Hub; Social Hub; Readers Hub; custom file, task and download managers; and a feature that allows you to take a screenshot anywhere in the OS and then share or doodle on it. All told, these customizations aren't terribly intrusive, but not every single tweak registers as an improvement over stock Honeycomb, and fans of vanilla Android might resent it on principle. 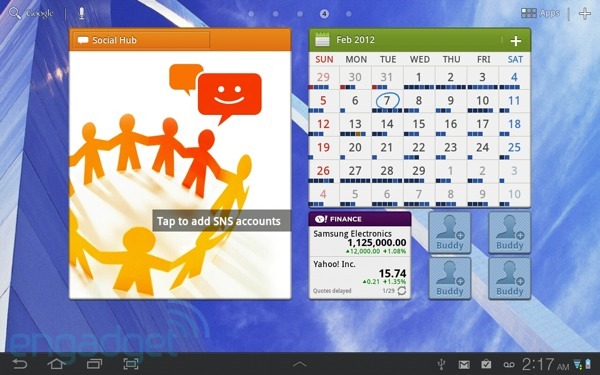 Otherwise, the list of third-party apps is limited, with Polaris Office and Pulse as the major stand-outs. Beyond that, it's Google-made apps, such as Places, and all the little pieces that make TouchWiz TouchWiz. We can't remember ever seeing a tablet this size that was so carefully designed. Though we tested the lowest-end model with 16GB of internal storage, it's also available in 32GB and 64GB flavors. Of course, it's also headed stateside, where Verizon Wireless will sell a variant with LTE and CDMA radios inside. Unfortunately, though, the company hasn't announced pricing and availability, and we also don't know if it will be possible to buy the tablet off-contract and buy pay-as-you-go data packages as needed. So, US friends, if you like what you see here and you gotta have it now, it's time to call an importer. Then again, even in markets where you can purchase it domestically, you'll pay dearly for that sliver-thin design, long battery life and Super AMOLED Plus display. A quick perusal of Amazon UK, for instance, shows that the 16GB model with an HSPA+ radio costs £808.48, while the 16GB, 3G-enabled 7.0 Plus can be had for £521.24. Obviously, we don't know domestic US pricing yet, but if the 16GB 7.0 Plus costs $350 here, the entry-level 7.7 is going to be expensive for a 7-inch tablet. Point is, this is not for the faint of heart or folks who are just in it for the YouTube videos. 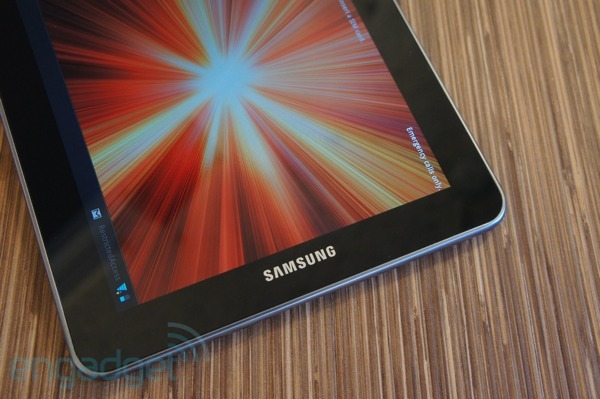 If you're looking for something as thin, light, beautiful, fast and long-lasting as the Galaxy Tab 7.7, you won't find it -- not in the 7-inch category, anyway. The question, then, should be, how much are you willing to pay for near-perfection? If you're reading this section as a primer for your own comparison shopping, we're going to go out on a limb and assume you're well aware of the Kindle Fire and Nook Tablet, but decided not to take the sub-$300 bait. Indeed, while these products offer a compelling set of features for the money (along with surprisingly decent screens), you'll find the battery life mediocre and the overall performance lacking, especially compared to a powerhouse like the 7.7. Even in the middle tier, though, many of the options are unsuitable, thanks to short battery life, thick, chintzy designs or sometimes both (we're looking at you, Toshiba Thrive 7"). There are a couple compelling options, though -- namely, the Galaxy Tab 7.0 Plus and the T-Mobile Springboard (also known as the Huawei MediaPad outside the US). The 7.0 Plus, in particular, is thinner and lighter, with faster performance and two hours more runtime than what the Springboard is capable of. Still, despite some middling battery life, the Springboard is attractively designed, well-made, decently fast and sports a lovely IPS display. If you go for that, though, skip T-Mobile's two-year agreement and pay a little extra for an off-contract device for which you can buy HSPA+ data packages as needed. As crowded as the market for Android tablets has become, the impossibly long-lasting Galaxy Tab 7.7 belongs in an elite echelon of memorable devices -- a fraternity that's home to the likes of the older Galaxy Tab 10.1 and the ASUS Transformer Prime (GPS issues not withstanding). Putting it bluntly, the 7.7 is the best 7-inch tablet money can buy: it performs well, offers a stunning screen and manages to deliver twice the battery life of other small tablets, despite being markedly thinner. In fact, we can't remember ever seeing a tablet this size that was so carefully designed. But here it is, and it presents the same level of quality that the 10.1, iPad 2 and Transformer Prime offer in the 10-inch category. Really, our biggest caveat is that it's expensive, even compared to mid-range models like the $350 7.0 Plus. The 7.7 isn't a plaything for mainstream consumers, but people who care deeply about laying claim to the latest and greatest gadgets, and are willing to pay dearly for the privilege. As any early adopter would tell you, getting burned on price is just one trade-off to scoring bragging rights. Indeed, such enthusiasts might well decide that nearly $250 premium over mid-range tablets is worth the long battery life, brisk performance and brilliant display. So is that you? Do you need the best that badly? We'll let you do some soul-searching and chew on that for a bit. Update: Though the global HSPA+ model we reviewed has no IR emitter, the LTE / CDMA version headed to Verizon Wireless does have one. Special thanks to Negri Electronics for loaning us this unit.